Hunting the Lepus, Paco showed me that with the 454, "close was good enough"
I eased my way across the dry wash and up through the brush, my gun ready. I had been following this critter for an hour and he had not given me a clean shot yet, but I knew if I was persistent sooner or later he was going to. Coming down a hillside my daughter whispered "Dad! Over there!" pointing across the ravine. There he sat near a prickly pear about 120 yards away, confident that he was hidden. I sat down and leaned back on my left elbow, raising my right knee and laid the pistol alongside it to steady it. I put the sights on the animal as he sat silently there and squeezed the trigger At the shot I saw him jump into the air and then I heard a "whop". He turned and hopping slightly went out of sight behind some Spanish Dagger. The shaking of the brush told the story.. he was down for good. We made our way over to where he lay, a huge old Antelope Jackrabbit, Lepus alleni. There are 3 species of Jackrabbit in the lower 48 States, Lepus californicus - the Blacktailed Jack and the most common; Lepus townsendii - the Whitetail Jack which is found mostly from Colorado northward into Canada; and Lepus alleni - the Antelope Jack which is found only in Southern Arizona. Technically these are not really a rabbit but actually a hare if you want to nit-pick. I have hunted all 3 species and found them to be tough, cunning and capable game. The Whitetail Jacks that I hunted in Colorado were every bit as tough as the Blacktails and Antelopes that I hunted in Arizona. I learned as a young boy that you have to stalk close, take your time and put the bullet in the right spot or you were probably going to lose the rabbit. I have seen Jacks take a solid hit from a .45 Colt, be disemboweled, and still run 50 or 60 yards. If they grew as large as deer we would probably have to hunt them with .458 Magnums. The name "jackrabbit" as applied to these creatures was originally "jackass rabbit" due to their large ears. This was later shortened by common usage to "jackrabbit". They have wonderful hearing, great eyesight and are very fast. The Antelope Jack is the fastest of the three and have been clocked at speeds in excess of 40 mph. Growing to 8 pounds or more, these big guys can jump 15 feet in one leap. The only native American animal that can outrun an Antelope Jack is an Antelope. 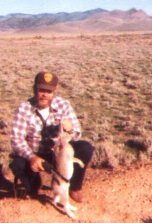 In the summers I used to go up to Colorado to my friend Robert Smythe's Heart Bar Ranch and spend a week shooting Jackrabbits. They were mainly the White-tailed variety. A dozen of these critters can eat about as much as a cow and Lord help you if they get into your haystacks! Robert told me one winter he stopped counting after he counted100 of them coming out from under his hay. I would pile in the truck with several different guns and lots of ammo and go shoot Jacks for awhile on his ranch. I used everything from .22's up to heavy-loaded .45 Colts. Unless you busted them through the shoulders they would usually run quite a way after being hit. Using Stingers and Yellow Jackets in the .22 Single Six I dropped a number of them but still remember one that ran over 1/4 mile before dropping after I put a Yellow Jacket through it's lungs. Of all the .22's the SGB made up on Hanned's tool worked the best. Robert kept track and of 100 Jacks shot one winter using the SGB, he counted 51 one-shot stops where the rabbit dropped immediately. The Blacktail Jack is the most common and most often seen of the Jackrabbits. Not as large as the other two it will still get up to 5 pounds or so and can run at speeds of over 30 mph. It makes for a challenging hunt. 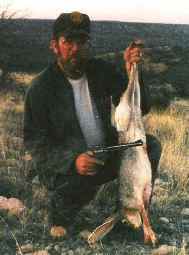 Paco Kelly and I hunted them with 454 Casull's when the guns were first introduced. Paco showed me that "close was good enough" with the 454. One day we came up to the top of a ravine and there, down in the bottom was a large Jackrabbit. Paco dropped the hammer on him and when the dust cleared the rabbit was laying there dead. We made our way down to it and found that his 260 gr. slug at near 2000 fps had missed the rabbit but all the shrapnel from the slug and the rocks had dropped it in it's tracks. I went over to see what had gone up into the air and found it was his head. We didn't eat that rabbit. He was already reduced to ground meat but it would have taken so long to collect it all that it wasn't worth the bother. And we did eat Jackrabbits, but normally only in the Spring when the grass was still on and it was still cool. Dad would grind the meat and make a sandwich spread with it. He was living on the Spear S Ranch near New River, AZ in those days and we would use it for when we were out working and had to take a lunch along. I remember it was quite tasty. I have not shot a Jackrabbit in years. Back in the 1980's there was a disease hit them in Arizona and the population dropped quite a ways. I had several that lived near our place and I protected them, letting them raise their young in peace. The last time I hunted in Arizona the population of Jacks seemed to be coming back, but I do not know that for sure. Those who live there would know better than I. The large Antelope Jack in the photo is probably the last one I ever killed. It was just at dusk and as we came across the mountains I could see it setting on a hill in the distance, it's sides shining in the setting sun. I got out of the truck and made an offhand shot. The rabbit disappeared in a dust cloud and I heard the "WHOP!" of a bullet strike. My Dad said, "I can't believe it!" and paced it off from where I was to where the rabbit lay. It was 212 of his paces (he stands 6'1"). The load I used was the old Keith SWC #454424 over 18.5 gr. of 2400. Note how large bodied this rabbit is compared to the 7 1/2" barrel on the Ruger 45. It is just a typical sized Antelope Jack. I do know that I liked hunting the Jacks! As a young beginning hunter they helped me to learn how to hunt, how to stalk, and how smart and elusive wild things are. I will always be grateful.